The Weston WEL-4000 40 inch Full HD LED TV is a smart TV which has endless connectivity options and several cool features. Although this 40-incher is not as popular as mainstream brands, it is definitely worth giving a try. The Weston WEL-4000 40 inch Full HD LED TV is priced at INR 32000 which is quite reasonable. Have a look at the features and decide for yourself. The brand promises that this smart TV has over 2 million pixels. This results into picture perfect clarity. It offers an amazing viewing experience with the natural colour reproduction, brightness, and detailing. You can now connect and stream HD videos from your phone in your TV. Movies or shows can be watched on the big screen by connecting the phone to the TV. Even better, you can play games and look at photos by streaming apps from your phone and tables on to the TV. Screen mirroring is quite handy. Weston TVs provide surround sound system with psychoacoustic process. This places the sound beside, above and behind the audience. You can also watch TV, insert files, read ebooks, stream music, or movies by connecting the USB drive. It has enough input ports for all your needs. For the social media generation, you can access YouTube, Facebook, and Skype on the television. The TV has an KitKat OS, so you can use many apps on the TV. The Weston SMART Full HD comes with narrow bezel design. This means that there is hardly any space between the screen and bezel. Hence, this results into good output on the screen. It has 1GB of RAM and 8GB ROM for smooth functioning. For better experience, it has a 178 degree viewing angle. It is the only brand in India to use samsung grade panels. This helps in improving light reflection. 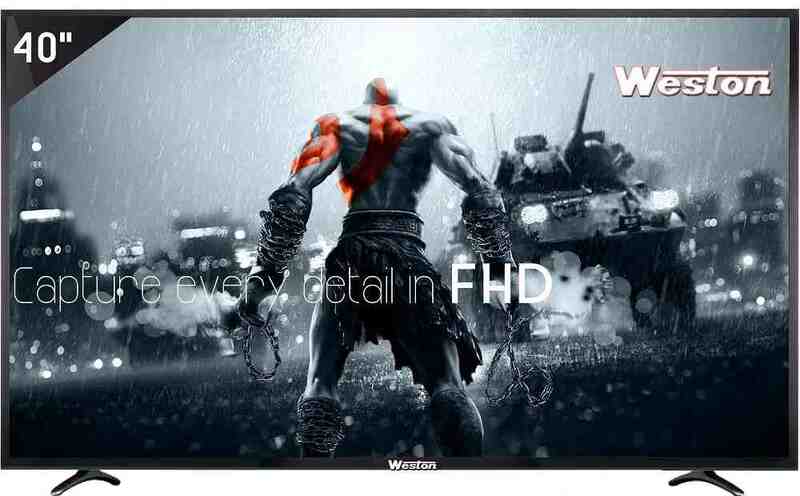 Weston WEL-4000 40 inch Full HD LED TV full specs and reviews as of Apr 2019. Buy it here!